Starting 1 Sep 2014, SAF will be implementing a new IPPT standard. There will be 3 stations. Chin-up, Pull-up and a 2.4Km run. As compared to the old standard, scoring system is kinda of different and much more complex but we are lucky to have awesome developers who created IPPT score calculators to help us out. Update: If you an Windows Phone user, there is also an IPPT app for you. It is created by Trident.sg. Scroll to the bottom for more apps. You can use both of these calculators on your browsers. IPPT Scorer: This site is simple and convenient to use. You just choose your age and it will calculate your score based on a preset standard. You are also given the options to set your standards too. This site is also covered by our local media. IPPT Score Calculator: This site offers a bit more comprehensive data about the scoring system and even adds the options for Commando / diver / Guardsman. When I tested it, it was a little buggy because it allows you to score 0 for a station and still pass if you put “high score” for the other stations. We need to score in all stations for ippt. Creator John Luo, CTO of 8packs – a race management system that makes organising runs and sports events easier. New IPPT Calculator: Free iOS App. This app lets you easily calculate the Points and Award (Gold, Silver, or Incentive) that you will get based on your fitness performance at the 3 testing stations. 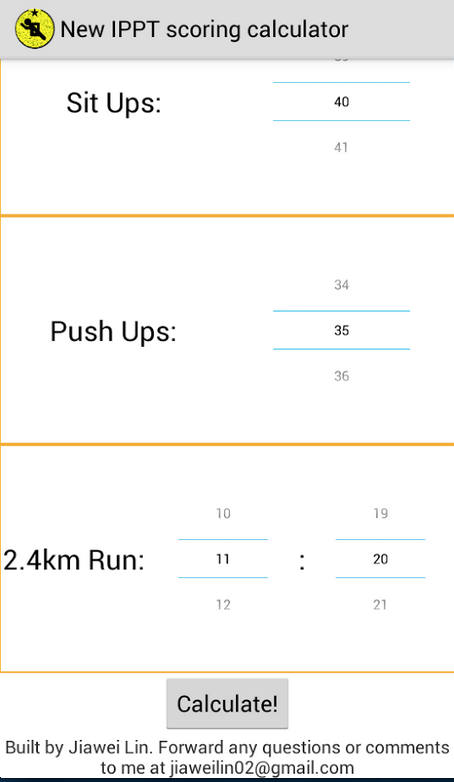 New IPPT Scoring Calculator: If you are looking for an Android App to install this is the one. Way to Gold: Windows Phone users, there is something for you too :D.
Creator Trident.sg. The team also created iPhone and Android too. They are all free plus the creator told me that they are in the mist of updating the apps after getting feedback from existing users. Thats about all I found on the web, do let me know if you find others that I have yet cover. By the way, if you wonder why are these developers creating these calculator for the new scoring system, check out what SAF is giving us to calculate our scores. Next Post Time for a hoodie maybe?